Manufacturer of Magnifying Glasses & 3D Paper Glasses. 1. Bar magnifier with clip / ruler magnifier. 2. 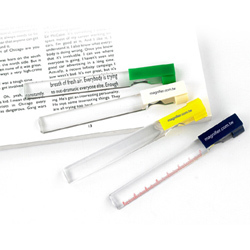 Lip stick semi bar magnifier with pen clip. 3. with different design shape clip available. 4. Size:112mm L x13 mm DIA. 5. Your own design on top clip will be acceptable.